Whether you are cleaning your tornado bong or bullet pipe daily or once a month, to get the most out of it, you have to make certain you are carefully cleaning it thoroughly. Besides the obvious reason of killing any remaining bacteria that is trapped in the glass, cleaning your bong correctly and frequently provides a fresh session that can really turn an everyday smoke session into a truly memorable one. It goes without say that you should never attempt to clean your pipe or bong after you have just finished smoking with your device. Lack of focus and clarity could result in the device easily cracking or breaking. Here are three simple ways that you can restore that pipe or bong to the condition it was when you first purchased it. Denture tablets can be quite effective at removing contaminants from the inside of the bong or steamroller pipe. What you will need to properly clean your smoking devices are some denture tablets, sealing Ziploc baggies, water, and pipe cleaners. If you are cleaning your bong, place the bowl and slid in their own Ziploc bags and set aside. Next, place three denture tablets in the bong and then fill with hot water. The fizzing process should last up to 30 minutes, and depending how dirty the bong it may be less or more. Place one denture table in each Ziploc bag and fill with water and seal. If some of the parts are more resinous than others, grab your pipe cleaners and begin wiping over the build-up until you see it breaking free. After the tablets have fizzled out and the pieces appear clean, rinse everything with hot water and dry completely. If you are cleaning a small or mini pipe like six shooter pipe, place in the Ziploc bag and follow the above instructions. This home remedy for cleaning your pipe and bong is quite effective and affordable. The only things that you will need to clean the bong or pipe with this method are some table salt, rubbing alcohol, water, and plastic Q-Tips. Take the bowl and the slide off the bong and place off to the side for a short while. Run hot water through the bong for several minutes to help to loosen any of the resin that is trapped on the surface of the glass from your last smoking session. Once you have thoroughly rinsed the bond, scoop three tablespoons of the table salt and pour into the bong. Now add a half of a cup of the rubbing alcohol to the salt. Carefully cover all the openings and then gently shake the bong so that alcohol salt mixture gets into everything. Allow the mixture to sit and soak for several minutes before grabbing your plastic Q-Tips and working areas where the residue is still present. Plastic Q-Tips are preferred because the paper ones will break quite easily from the pressure of scrubbing the contaminants off the surface of the glass. Once completed, run under hot water for a few minutes to rinse away debris. Use the same process for the pipe and make certain all that alcohol is cleaned away before your next smoking session. If you have not already heard about Formula 420, you can purchase your own bottle at the end of this brief explanation and discover how and why it works so well. Forget about all those toxic cleaners on the market that could leave behind a poisonous residue that you may be inhaling during your next smoke session, the 420 Formula is earth friendly and made from all natural ingredients. 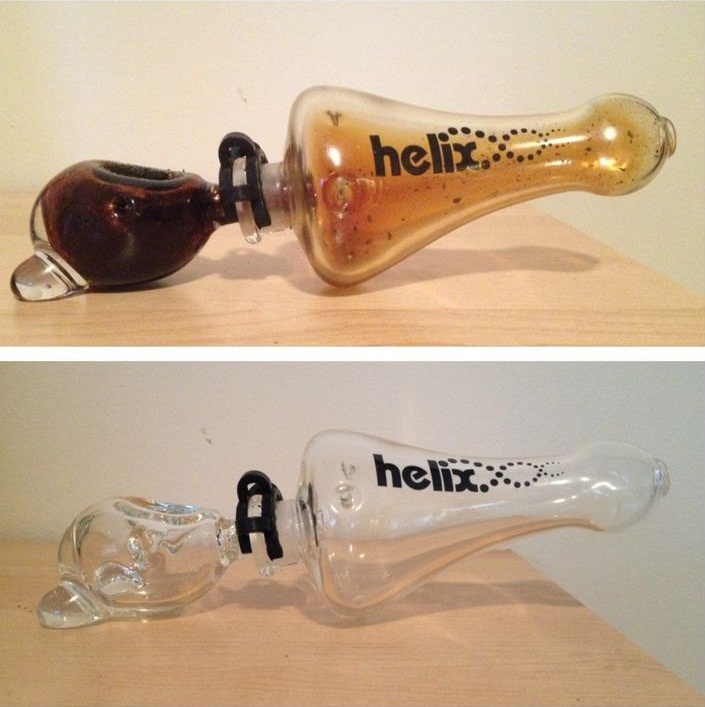 The patented abrasive cleaning technology eliminates the need to be scrubbing and soaking your bong or pipe, basically, you shake, you rinse, and you get smoking again. Although this product is more expensive than the other two methods we described, you can clean your devices in less time and still have plenty left over to use the next time you want a crystal clean smoking apparatus. 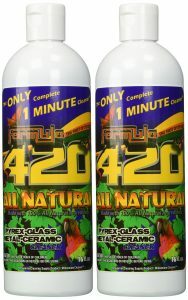 All you have to do is simply give the bottle of 420 Formula a good shake to mix up the liquid and crystals in the bottle, add the biodegradable cleaner to the bong, and shake. If any residue remains, simply repeat the process. Once complete, rinse with hot water and allow to dry. Repeat process for the slide and bowl.